JET is a proud member of the CFIB. JET Uniform and Supply Ltd. is based in Red Deer, Alberta. We outfit and provide facility needs for service companies, restaurants, institutions, schools, and more in industrial and commercial industries. We bring so much more to your company than simply ensuring clean, mended uniforms, institutional cleaning supplies, or stocking your washrooms. The added-value received from each of our services will help you save money and time, while providing you with durable, quality products so you can focus on your business. 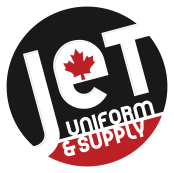 JETÂ Uniform and Supply Ltd. is owned by Stephen Milaney and Ross Stuve.Â Stephen and Ross, together with a solid team of knowledgeable sales and service staff, are able to provide your uniform, workwear, safety equipment, and janitorial supply needs. Nearly 10 years ago,Â Stephen and Ross bought a business that provided industrial laundering services to oil companies. They built on their knowledge of wholesale cleaning supplies to develop their vision to become a complete, one-stop service provider of industrial workwear, uniforms, PPE and safety supplies, cleaning products, and related value-adds to make the job of outfitting a company easier for those who have to do some of the toughest jobs on earth. Because we are a locally-owned company, youâ€™ll find our level of service unsurpassed in Central Alberta. Our ability to customize programs that work for you is unique to our industry. We have no intention of locking you into a rental or service program that is mis-matched to your needs. Youâ€™ll find our team is flexible, knowledgable, and most importantly, we add value to your business! We enable you to do your job without the hassles involved in outfitting your people and taking care of the details around the facility that no one wants to do, but are vital. In March 2008, a catastrophic fire nearly ended our operations. While others may have walked away, we dug deep and found the strength to continue to serve our customers and grow our business again. We say a heartfelt thanks to our customers, suppliers, family, and close friends who have supported us and encouraged us to carry on. We understand the value of hard work and it is important to us to help the people in our community thrive. We are proud that every one of our employees serve at the Red Deer Food Bank each month as part of their employment with our company.Â JET absorbs the wage costs by paying our employees to work a monthly shift at the food bank as if they were working a regular shift. Every month, our employees and management team contribute up to 70 hours of volunteer time to help those in need. This contribution model is unique in our community. The food bank provides a critical service to the people in Red Deer and we are honored to be able to serve them. © 2015 JET Uniform & Supply. All rights reserved.